One was from a Twitter account responding to a prominent lawyer who interacts on the mini-blogging service. It was blunt and to the point, which is how I’ve usually seen this sentiment made. To be fair to that “Tweep”, as the old identification goes, one of my more militant fellows had decided that it was just the moment to be snarky in response to one of the lawyer’s anecdotes. It was a cute, wholesome story, not requiring anti-religious pompousness in reply, but he just had to be edgy. I think the response from the Tweep was sharing a common belief that such “hallowed out” people are angry at the world and their fellow man and have no problem showing it. The other was from the writer Andrew Sullivan, who had a column last week in NY Mag where he spent a great deal of time on the corollary that I’ve seen usually accompany the Tweep’s assertion, that the non-religious try to replace this supposed emptiness with another form of religion. He maintains that the non-religious (or less religious) on both the political left and right replace this with something else. For the left, that thing is social justice, or a set of diagnoses about and policy prescriptions for society. On the right, it is devotion to a wannabe strongman political figure like President Donald Trump, someone who will encourage their nationalist tendencies and xenophobia and the anger behind these things. Andrew’s words were not blunt like the Tweep’s but ultimately carried a similar line of thought, that the non-religious, lacking a clear purpose, will try to find it in all the wrong places. That they will ultimately be driven by their emotions into the arms of people and ideologies that are toxic. Although my primary goal of this trip is riding the trains, one of the disadvantages of spending only a small amount of time in any given place is that when something happens, you now have even less time to explore that place than you did before. Such was the case with this leg of the trip. It actually started on the second night in London when suddenly I was experiencing a nausea-like feeling from my stomach. I’m still not sure what it was – maybe a stomach acid thing – but fearing a stomach bug, it sent me back to my room rather than seek out food that night. I would note that I was still transitioning to the time difference, travel fatigue and all, as well as having kind of pushed myself the first day to stay up, so that may have been part of it. Regardless of the cause, I was able to get up and to the station for my Eurostar trip to Brussels. Thinking that maybe the issue was lack of food, I grabbed some breakfast after passport control in St. Pancras. The train trip itself was indeed fast and uneventful. We passed through the Channel and into France and then Belgium. Upon getting to Brussels, it was clear this stomach issue wasn’t going away. Still thinking it might be food-related, I found some lunch, and then pushed off to Gent, my destination in Belgium. After some previous discussions, it was clear there isn’t a whole lot to do in Brussels, anyway, so I’ll visit properly another time. It wasn’t long to Gent, about 25 minutes. Once off the train, I found myself in a bit of a bind. I knew I had to take a tram to a street near the hostel, but it wasn’t immediately clear to me how to get a ticket. The machine only took certain coins and even after getting them, it still didn’t work. I finally was able to ask a waiting passenger if they sold tickets about – turns out the answer is yes. Once I checked into the hostel, I was feeling better, so I took a walk around the old part of the city. It’s a nice area, with some thin streets, some wider ones, and even a castle and some churches. All in all, it’d be a nice place to stay for a few days and I will return. Although I was able to walk a decent distance, my stomach had other plans, and I had to return to the hostel. I got a few hours sleep. I wasn’t happy about it but thought it better than getting ill. After waking, I thought I’d better get some food, so went to a nearby place. Nothing special – just some nuggets and fries. Something was definitely up, though, because my appetite was shot. I ate as much as I could and returned to the hostel. One thing becoming apparent by that time was my constipation. It is unusual for me not to need the bathroom at least once per day, and with Crohn’s it’s usually more. I now wonder if that was part of the problem, perhaps in combination with crap food and not a lot of food. The next morning I was feeling better, so it was off to Gent station and to Amsterdam. Hello from London! So far, mostly so good. My adventure started off on April 1 (no joke) with a bus ride from Hartford and then a shuttle to and flight from Boston Logan. Boston has done a good job getting people from the bus terminal to South Station, so props to them for that. No real trouble at Logan, except the flight was delayed 20 minutes. I even got an aisle seat in a nine seat row, so that was very nice since the Crohn’s was acting up a bit. Passport control wasn’t bad at all, though getting though it took about an hour. Had some slight trouble at Gatwick Station accessing my ticket. I guess with my ticket, it is mobile only and I hadn’t downloaded it to my phone! Finally asked someone about the issue but their Internet was a bit shoddy. Eventually got my ticket and was off. No such issues with the Underground to my hostel. It was very easy to get a ticket. Like with all subways, it takes a moment to learn it, but it was not too bad to figure out. After six hours in London, got to the hostel and settled in a bit. I then took off to see some sights, starting with Trafalgar Square. 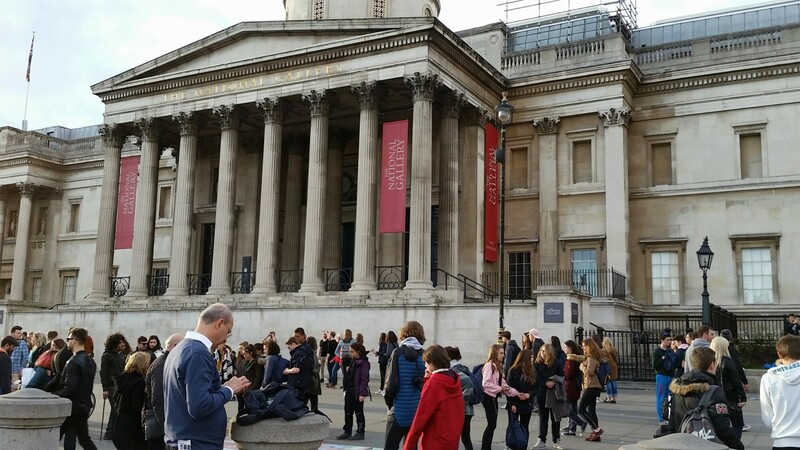 Lots of people milling around there and going to the National Gallery. 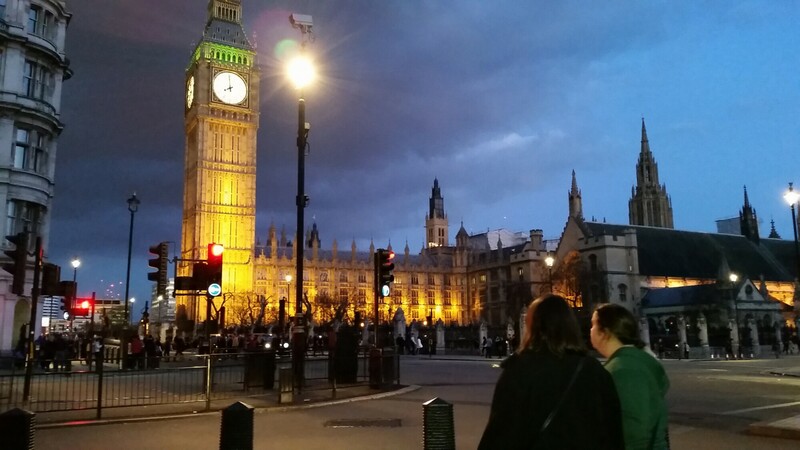 I spent a little time there and then headed down to the Palace of Westminster and Big Ben. Despite the recent attack, there were a lot of people. I took a walk around the entire building and also took a look at the London Eye. Waited there until night to get a photo of the lit up building. After that, I was tired as heck, what with being up since 9am on Saturday. Therefore, I headed back to my room for a nice sleep, albeit with a glance over at the Prime Minister’s residence and a trip part way across another bridge. 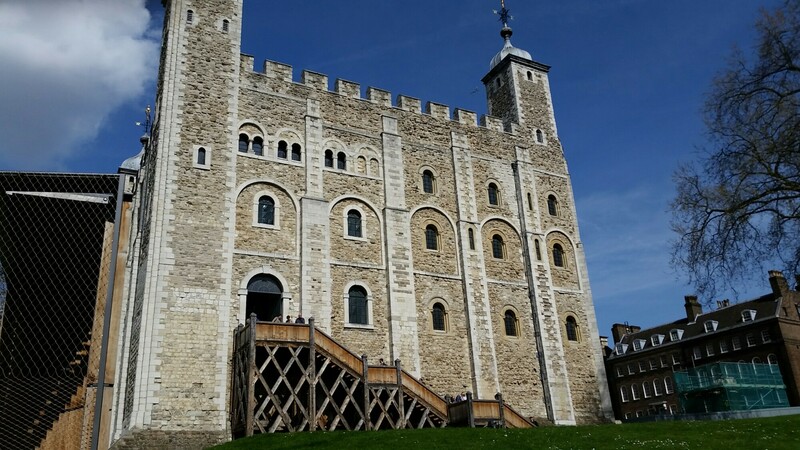 The next day I spent exploring the Tower of London and Tower Bridge. 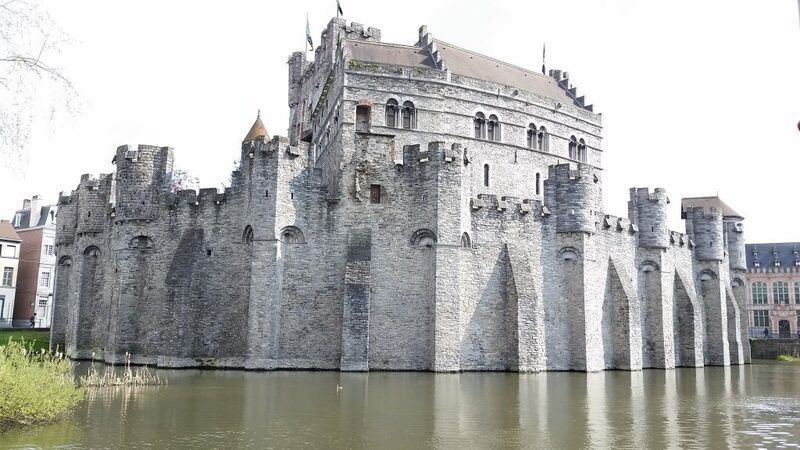 For the castle, definitely an interesting history, from its use as a home and a fortress, to its darker side as a place for torture and imprisonment, and a holding place for the Crown Jewels. I’d definitely visit again because it seemed like there was some things I missed, just looking at the architecture alone. The Bridge was alright as well, with a fantastic history, though I’ve seen similar attractions elsewhere. Wasn’t there for a bridge lifting experience but I’d like to see one if I get back to London when one is scheduled. After that I ended up getting almost lost in the Shad-Thames area. It might have been just me getting claustrophobic from narrow streets, but it seems like an area that’s misleadingly sketchy. As I now know, it’s an area with many wealthy residents. 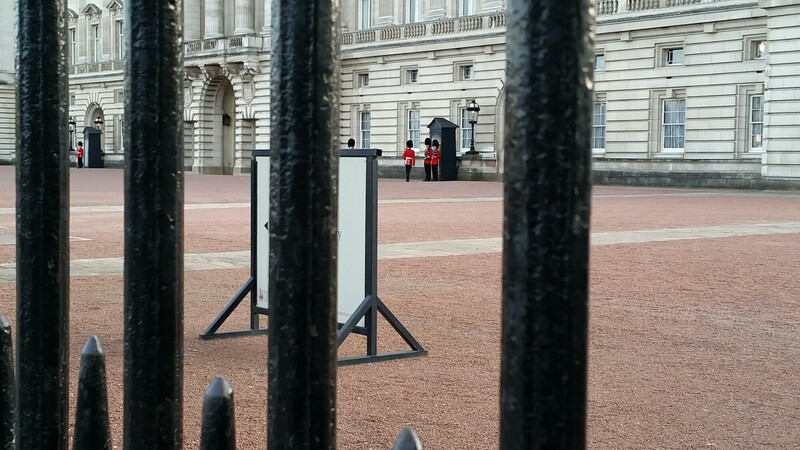 I’d like to have explored it more but wanted to get to Buckingham Palace, so I turned back. 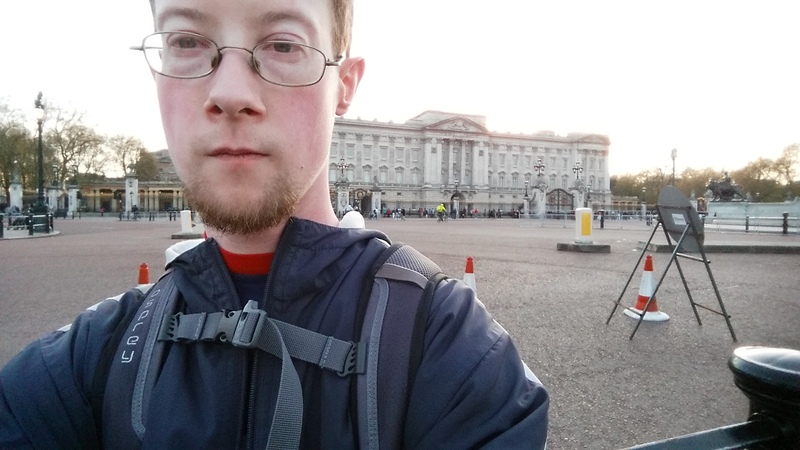 I got back to Westminster and headed down to the Queen’s house. No sight of the Queen but I did catch a guard-changing ceremony (not one of the main big ones, just literally one guard being relieved). I only spent a short time there, given the length of the train ride and walk but wanted to get back to the hostel to sleep before an early morning Eurostar trip. I cut through St. James Park to get to its station, where I had the weirdest experience. One of the pelicans that resides there started marching toward me and yelling. I’d just been eating a snack, so I expect that had something to do with it, but I had nothing for it and wasn’t going to feed it, anyway. It didn’t hassle me after I went past it, though, and I continued on my way. Got to the station and headed back and prepared my stuff and showered. I was still kind of dozing off from a long three days of travel and sight seeing, so you might think I slept well that night. No such luck. Got about four hours of sleep and couldn’t get back to it. So I uploaded some photos, checked some emails, and made sure my Eurostar ticket was downloaded onto my phone (lesson learned). Got up, checked out, and Undergrounded it toward King’s Cross St. Pancras. Now I’m headed toward my next stop in Belgium. I’ll be back in London for one more day at the end of the trip, so hope to do a bus tour and maybe the British Museum. All in all, I think a longer future trip to the UK is warranted. Less Than 7 Days Until Europe! I haven’t written much about this trip, here or on Facebook. In fact, I haven’t written about a trip here since the big Cross-Country train trip in 2015, even though I’ve been to San Diego (on business) and to Orlando and Canada (Niagara Falls, Toronto, and Montreal – for pleasure) since. I’m heading to Europe for 16 days in just under a week from now. I’ll be getting back to the continent after 10 years away, the last trip there being to Greece in 2007. It’s going to be a bit of a whirlwind of a trip. Why? Because I’m my own worst enemy. 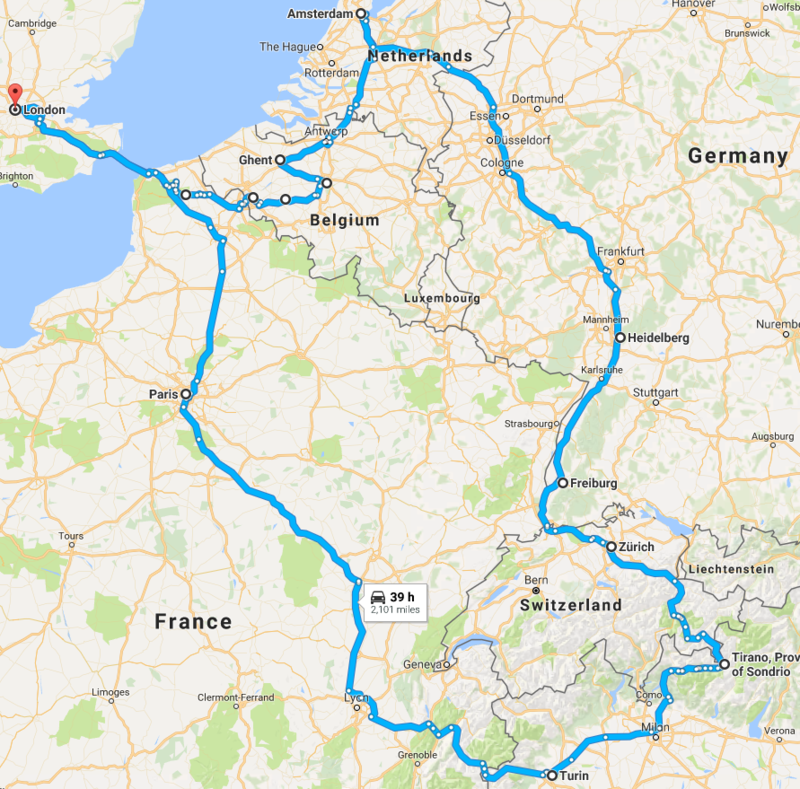 What started out as a desire to travel to London and then east to Belgium and The Netherlands has since turned into a bit a monster of a trip that will see me travel in all four cardinal directions. I’ll again be going on a massive train ride that will take me to seven countries in this time period. The above map shows more or less the route I’ll be taking through Europe. Starting out in London for a couple days, I’ll continue on Eurostar to Ghent, Begium for a day, and then the intercity train to Amsterdam for a couple days. I’ll continue into Germany, stopping in Cologne and Bonn for a couple days. Then I’ll have what I think will be the first big highlight of this trip with a ride along the Rhine River on my way to the little southern German city of Freiburg. I’ll be there for a couple days as well. Part of what turned this trip into a monster is that, before deciding on much else, I got taken by the prospect of a trip through the Swiss Alps by train, which will be the second and probably prime highlight of the trip (I’m a sucker for a nice mountain range). After a night in Zurich, I’ll be taking the popular Bernina Express on that route, from Chur, Switzerland, to Tirano, Italy. I’ll continue on to Turin via Milan, and stay there for about a day and a half. Afterward, I’ll take a TGV train to Paris, where I’ll explore for another couple days. Then I’ll grab a Eurostar back to London for another day and then head back home. So definitely a lot going on in a relatively compact amount of time but it’s definitely going to be exciting. I look forward to seeing a lot of cool architecture, some of it very old, as well as mountains, valleys, and the backyards of seven countries. It’ll also be my first time on a high-speed train (including our own “high-speed” Acela), so that’ll be very interesting to experience. Queen Elizabeth’s birthday will be four days after I leave London for home. The French Presidential election will be seven days after I leave Paris. I thought about including Rome on this trip but there is no way I wanted to be near there close to or on Easter Sunday. I imagine it’ll be a madhouse as people go to The Vatican. I hope to do some updates while I’m there. I’ll be spending a lot of time on trains, so surely there will be some time. We’ll see how it all goes, though. I’ll have at least something on Facebook. What Kind of Temperament Do We Want in a President? Over the course of this campaign cycle, Donald Trump has frequently gone after people or organizations who have criticized him in some way. Usually that person or organization has been related to journalism. They’ll say something about him and he’ll hop on Twitter to fire off one or more tweets in anger about those he feels have slighted him. Wacky @NYTimesDowd, who hardly knows me, makes up things that I never said for her boring interviews and column. A neurotic dope! Crazy Maureen Dowd, the wacky columnist for the failing @nytimes, pretends she knows me well–wrong! Lying or not, they’re not just journalists. Yesterday he also went on one of his rants against Robert Gates, the former Secretary of Defense. Weirdly his defense for doing this is that Gates spoke out against his former bosses. Well, his last boss in government was Obama, so you’d think that would be okay with Trump, but I guess not. Never met but never liked dopey Robert Gates. Look at the mess the U.S. is in. Always speaks badly of his many bosses, including Obama. Once again we’re seeing how Trump immensely dislikes disloyalty to him personally and will trash anyone who goes against him, even in a small way. That is extremely disturbing as the president’s job is to represent the entire nation, not just his personal ego. But Gates was a political appointee, so maybe some think that opens him up to criticism like this. Okay, perhaps, but who is Trump going to go after next? Well, we know that despite his statements to the contrary, he’s perfectly fine going after first responders as he once trashed a fire marshal just hours after being rescued from an elevator by the marshal’s fellow firefighters. This person said nothing about Trump and yet it still happened anyway. Worse still, Trump doesn’t just go after people, he usually assigns them some kind of epithet. Just in the last 24 hours, he’s used “wacky,” “crazy,” and “dopey” on two different people. In the past, he’s been well known for using “bimbo” against people like Fox News anchor Megyn Kelly. “Lying” and “crooked” are also favorites of his, though they’re not quite as bad, and are pretty typical for a political campaign. The others, though, are just attempts to discredit the dissenter as someone to who people shouldn’t listen. Maybe that’s okay to do as a private citizen, but never okay to do as president. Who is Trump going to go after next? Will a President Trump go after a general who disagrees with him, even privately, or doesn’t quite get the job done? Maybe a rank-and-file member of the military? A member of a police force? A foreign diplomat or head of state or government. The point is that we really don’t know, but do we really want to give someone the presidency who so frequently goes on tantrums against people he doesn’t like? That’s what we as a nation have to decide this November. I see a lot of commentary these days from liberals regarding the “globalism” boogeyman. I don’t get what’s so bad about countries competing to attract business to themselves. This even happens within a country. For example, in the U.S. Texas or Florida might attract businesses from Connecticut. There have actually been some high-profile wooing from both states toward CT businesses in the past several years. I’ve seen some snark and some grumbling about it, but never the same level of concern that “globalism” brings out. Perhaps what is most concerning to these folks is that it’s easier for businesses to move than it is for people to move. This is even true within the U.S., though the obstacles for it are fewer. To move countries requires a lot more time, documentation, and money. It’s one thing to take a vacation in Europe for a while – an activity for which U.S. citizens have arguably the easiest of times – but it’s much more difficult to move countries on a permanent or semi-permanent basis. Maybe the next step in creating a global society is in ensuring freedom of movement as well as freedom of trade. We’ve seen what something like the Schengen Area in Europe can do, though it’s not without its problems since the common border controls increasingly seem not so common, as the emigration of refugees from Syria has shown. If it were easier for people to move in order to work, perhaps this would lessen fears about “globalism.” That said, I imagine that some locals would have a problem with this, such as how in the U.S. some people have a problem with increased emigration from countries like India and Mexico. While there are some legitimate issues brought up with this (since the more liberal emigration policies are too often one-sided), I think it too often leads to xenophobia, such as we’ve seen with comments from Donald Trump supporters and even from the man himself. 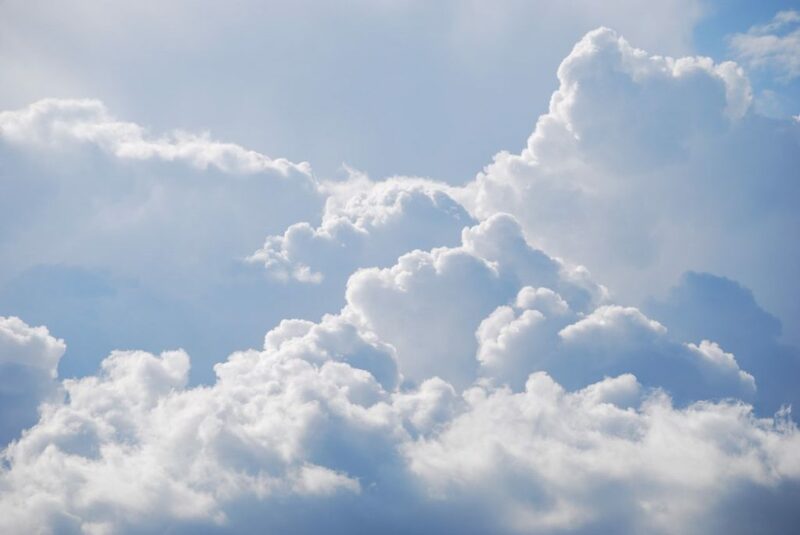 However, people generally just want to be part of whatever community they’re in and will do whatever it takes to ensure they can work, play, and live their lives with as little wave making as possible. Just as competition in business generally leads to better products and services, I think competition among people leads to better people. This may sound like a bit of cold analysis but I mean it in the best of ways. I simply think we have nothing to fear from new people moving in, whether it be people from India coming to America or people from America coming to India. I wouldn’t mind seeing a Schengen-type scheme for North America, including the U.S., Canada, and Mexico, so that’s it’s easier for people to work and live among our three countries but I think it’ll take some time to achieve this. I decided to get to the next cross-country train by way of Los Angeles by taking the Coast Starlight, a train that goes from Seattle to LA. I only took the Southern portion of the route. After Billy Joel the previous night, my intention was to get some sleep on this train, but that didn’t really happen. Oh well. This ride did give me some insight into the extent of the drought. We passed by hundreds of miles of grass that had a dull yellow color to it, other than on the top of some hills and mountains. The most exciting part of this trip was being next to water for a good extent of the length of it. On the train itself, the best part was the Pacific Parlour Car, a 1940s/1950s-ish style car with couches, armchairs, and a full bar. It even had wi-fi enabled when we were in an area with reception. We got into LA’s Union Station about an hour early. I found my hotel pretty quickly – nothjng special – but it was near the hotel and good for a night. I’d had dinner on the train, so desperate for some sleep, I headed to bed. The next day I got up early to take a trip to Santa Monica to visit Ed, one of my cousins. I got to see his recording studio (he does recording and the Santa Monica pier. We also had breakfast at this great Mexican place that also serves a traditional breakfast. They had like four full pieces of toast and a few pieces of bacon for about $7.00. That’s a lot of food! The pier was busy but not unmanageable, and I was able to see the Pacific Ocean and the promenade. After that, I thought I should get back to downtown LA so I could get my luggage, which I left at the hotel and head back to Union Station. By the way, they need better signage for the subway. The sign says Red Line, but is the entrance for all the lines served out of Union Station. I was able to spend a little time in the station’s Metropolitan Lounge, which was pretty swanky. After about half an hour wait, I boarded the Southwest Chief back to Chicago. So I arrived in San Francisco – actually, Emeryville, which is just outside the city, near Oakland – only to find out that I forgot to add on a bus trip connection from the trajn into the city. Whoops. Got an pass in the station and got on the bus to Fisherman’s Wharf. Not knowing the bus routes at all yet, I took a taxi to my hotel. The Chelsea Motor Inn, in the Marina District, is part of a set of hotel that emulate a motor inn. It was pretty no-thrills, but I needed a place to sleep, and it was relatively cheap for a hotel in the city proper. It is surrounded by bars and restaurants, especially brunch places. Just getting in and it being pretty late by then, I took it pretty easy, especially as I hadn’t slept very well on the train. Got some necessities at a nearby Walgreens and took a walk of the immediate area, selected a nearby Italian place for dinner, then went to bed. Got a late start the next day due to wanting more sleep. I think people oftentimes want to get a full day of activities, but I think a late day here or there during a trip is okay. I’m having a very early day on Sunday, so it’ll balance out. I decided to start with Fisherman’s Wharf. Before the trip, I purchased a CityPass, which got me access to several museums, a cruise in San Francisco Bay, and most importantly, unlimited travel on the Muni system of electric and diesel buses, light rail, historic street cars, and cable car trolleys. Basically, no more taxis (except, as of this writing, maybe on Sunday morning. I took the cruise and it was a pretty good way to get an up close look at the Golden Gate Bridge, and some history of the city. Very cold and windy, though! In fact, that was my first lesson when arriving in the city. I knew it would be cooler than Los Angeles or even Chicago (making my clothing choices, if you didn’t know my plans, look like I couldn’t decide what to bring), and even windy, but I wasnt prepared for the intensity of the wind. I brought my coat and jeans, so I was prepared, but I tried to go out the first night without it. Rookie mistake. I next went to the Aquarium at the Bay (my other option was the Monterey Aquarium, two hours away). It had a lot of cool fish and I got to touch a ray! I think they knew the game of which they were a part, as they kept coming right up to people. I thought the aquarium was okay for what it was. True to its name, it featured animals mostly from the Bay Area. ravel to the Transbay Hub, but I felt a little lost still, so turned back. I ended up grabbing a cable car trolley (no, I didn’t hang off the side). Without the city pass, it would have cost $7.00, but with the pass, it’s like having another bus option. I got off on a street that had the bus I needed to take and found myself in Chinatown. When I salked to the bus stop, there was some kind of performance going on across the street. I later found out it was in front of the Kong Chow Temple, dedicated to the god of war, Guan Di. It was after closing time, so I’m not sure of the occasion. A private event, perhaps. Boarded the bus when it arrived and headed back to the hotel. I either ate too many of my snacks, or maybe it was from my hotdog lunch, but I did not have a great night Wednesday night. Feeling kind of woozy, I just stayed in my room on Thursday and got some rest. I felt better on Friday morning, so I went to Home Plate, a popular brunch restaurant near my hotel. There wasn’t much seating, so I thought there’d be lengthy wait, but being a solo traveler has its advantages, and I got a seat at the bar-like area quickly. I had a breakfast of pancakes, bacon, and apple juice. It was pretty good. There were only two pancakes, and I thought maybe there wouldn’t be enough to fill me up, but it did. The restaurant is also known for its scones, which it gives before the main meal. Not really having scones before, I thought it was okay. After breakfast, I returned to my room to wait for my pickup en route to the redwoods at Muir Woods. The trip took about 40 minutes, with switchbacks that reminded me a lot of ones I experienced during a bus trip in Greece. The park was pretty nice, with trees that were younger than some of the redwoods upstate, but still really tall. Spent about an hour and a half there – way too little time to get very far – so definitely will have to go back someday. Returned to the hotel, got some food, and called it a day. On Saturday, I traveled to Golden Gate Park to see the California Academy of Sciences and the de Young Museum, an art museum. Also didnt have enough time to see either, nor did I see the Legion of Honor, another art museum. I had to get across town to get my ticket back to Emeryville, then to AT&T Park to see Billy Joel. He did a fantastic show – a mix of hits and catalouge songs. He definitely still has a lot of the range he used to. Some artists sound terrible when they get older, but not him. The audience was also very cross-generational. There were people 18+ at least. Sometimes with older artists, you wonder if they’ll attract a younger audience, and he definitely does. Everyone was singing along and I could tell they enjoyed it, too. The park was in a great location right next to the east bay. Just a great night. That’s it, really. Will have to get back to see the many things I missed, but despite being sick, I still had a really great time. Next, a day in LA, then a train to Chicago! Had a pretty low-key night in Chicago, what with a train to board the following afternoon. Woke up, got dressed, got some snacks for the trip, and headed for Union Station. Got a cab to the station, which is in a quite scenic part of the city. Headed inside, got some lunch, and located the waiting room. One nice thing about being a sleeper car passenger is having access to the station’s Metropolitian Lounge, which comes with nice chairs, better climate control, and it’s own access to the train. I didn’t have long in there by the time I ate. About 10 minutes. Oh well, I’ll have another shot at one in LA. Finally got on the train, about 20 minutes before departure. I put my big luggage in the rack; poor thing was alone pretty much until Denver. Good for me, though, as I needed to get something Monday morning. As you can see, my Superliner Roomette was pretty small, but it worked well enough for me. There are two seats, both of which fold down into a bed when needed, or when the car attendant comes around at night. There’s also a bunk above for the second person. There’s a single outlet, two reading lights, two overhead lights, AC control, speaker volume control, and a small closest. That’s about it. I spent much of my time in the lounge car, which is equipped with large picture windows and a smaller window toward the ceiling for sky views. The entire point of this trip for me was to see the country, and so I spent as much time there as possible. An attendant came around shortly into our departure to take dinner reservations, which I set for 6:45pm the first night. There were several options; on the first night I chose chicken, mashed potato, veggies, and ice cream for dessert. Amtrak does not skimp on its meals – not the chicken one, anyway, which was a very meaty half – and I left feeling pretty full. Due to space restrictions, diners are forced to sit together. I enjoyed it, though. I got put with an exuberant older couple, and another older woman also traveling to San Francisco. The couple were traveling to a place in Colorado for fishing and other activities. They seemed to be heavily traveled. I think England, France, Iceland, and Sweden were all in there somewhere. Yes, I’m jealous! After dinner, I returned to my room for a bit and then made another attempt at the lounge car. Unfortunately, it was dark by the and there was nothing to see, so I returned to my room to wait for bed service. I can’t really complain about sleeping on a train, which I knew would present challenges. I did wake up every two hours, but I’d been doing that for the previous week when I was hacking up stuff. After spending the previous day seeing farm after farm after farm, I woke for a final time on the second day to the short grass of Colorado, just outside Denver. As it was a longer stop, I took my chance to get in a shower, then headed down to breakfast just in time for us to begin climbing the Rocky Mountains. Met a nice man a breakfast who originated from Boston before also heading to San Francisco. Breakfast consisted of French toast and applewood bacon, and was very good. Switchback after switchback, we climbed and climbed, from Denver’s 5,000 feet to just over 9000 feet. The trek through was filled with tunnels, culminating in the 9 mile Moffat Tunnel, which was the longest one of the 43 tunnels traversed during the trip through the Rockies. After that, we had a short air break just outside a resort. Then back on the train for the next leg of the Rockies trip, bringing us to the Colorado River and three canyons. One of them, Byers Canyon, was the victim of a fire just last week. I could still see the charring from the flames, which went all the way over to the highway alongside the canyon. After working on this entry a bit, went to the lounge car to see more mountains. Had lunch with a doctor, a woman who used to work in medical ethics, and a woman heading to Burning Man. Lunch was a fried chicken piece with onion sauce and potatoes. If I’d known it was fried, I may have selected differently, but it was still good. Much of the rest of the day was spent in the lounge car, punctuated with a couple failed attempts to read a book. By lunch, we’d mostly passed through the mountains and were entering the desert, with its own rocky features. Took an opportunity to get off and stretch my legs at Grand Junction, CO. Took my second dinner at 7:15pm, only to find myself with the doctor from lunch, as well as a nurse and another man. Had a flatiron steak with mashed potatoes and veggies. The previous night, one of my dinner partners sent her’s back because it was too well done, but I had no problem with mine. It was very juicy and an easy eat. Returned to my room afterward, finally got a little reading done. Got ready for bed, but allowed myself a few minutes off the train at Salt Lake City. We zoomed through most of Nevada during the night, and I woke up to us about to arrive in Reno. By the time I was all set for the day, we’d passed into California and climbed into the Sierra Nevada mountains and the Lake Tahoe area, with evergreen trees aplenty. I made my way back to the lounge car, where I spent most of my time. Had lunch with two women from Boston who started on the Lake Shore Limited in Massachusetts (this seems to be a somewhat common occurrence, going from coast to coast). Then returned to the lounge car one last time before departing in Emeryville with a bus then taxi to the city and my hotel.